Key Takeaway: Have you experienced being so inspired that you’re pumped up to do your own thing? When you’re living a truly good life, and others can see how it’s changing you and others for the better, they are naturally inspired to follow you. Have you ever experienced the feeling of being so inspired by something you’ve seen or someone you’ve heard or watched that you’re just so pumped up to be like it (or them), or do your own thing? It’s happened a lot to me. And that’s how I’m here today. I began my social entrepreneurship journey through an exposure trip to the Gawad Kalinga Enchanted Farm in Angat, Bulacan, a province north of Manila, where we learned about the then-sprouting (pun intended) agriculture- and community-based enterprises that were working together to end poverty and take full advantage of the abundant goodness of the Philippines. From there, I got exposed gradually to other circles in the entrepreneurial scene, eventually getting to the Benita & Catalino Yap Foundation, which advocates both social enterprise and personal social responsibility. Through this, The Daily You – and basically my entire career in social enterprise – was born. Not that I jumped in simply from listening to my mentors and visionary father figures speak and inflame us with their passion and stories. I decided to make social enterprise a lifestyle because of what it represented and what it could do to change society for the better. Of course, I never believed – and believe – that I alone can create positive change. But I tell you two things: One, I would rather spend my limited (yet abundant) time on earth working to serve and make a difference, than being selfish and doing things just for myself and my family. Two, when a lot of you work together doing your own thing, yet with the same loft end goal in mind, you do achieve greatness. Hence, the importance of community and relationships. And a life of purpose is a great way to begin. When you’re living a truly good life, and others can see how it’s changing you and others for the better, they are naturally inspired to follow you. Because it has so good an effect on you, they are inclined to do what you do so they can “become good”, so to speak, as well. And for those who are seeking, or are lost, seeing how you’re helping others as a lifestyle will also guide them to get back on track and (re-)devote themselves to living a life of service. Living a life of purpose, therefore, is “catchy” and infectious – but in a good way. This is why and how community – the coming together of like-minded and passionate gamechangers – is important. We infect each other positively by spreading the eases (rather than diseases) of good ideas and actions. We help each other out. We inspire each other. This is the deep, deep joy I feel when I am with my social entrepreneur family. Look at bayanihan, the Filipino cultural concept of collective heroism where a group of people voluntarily agree to help together. It’s catchy – those who see others practicing bayanihan can’t help but wonder about it, and perhaps go and join them (although I won’t deny there are those who won’t budge, thinking that there’s someone there to help anyway). Living a life of service can be influential to others. And that’s what we here at The Daily You want to achieve: We want to guide both others and ourselves into living truly good lives of Higher Purpose rooted in Awareness and Service, and in the process inspire others to do so as well, who can then inspire yet others. Think of it as a pyramid scheme, but virtuous rather than vicious. 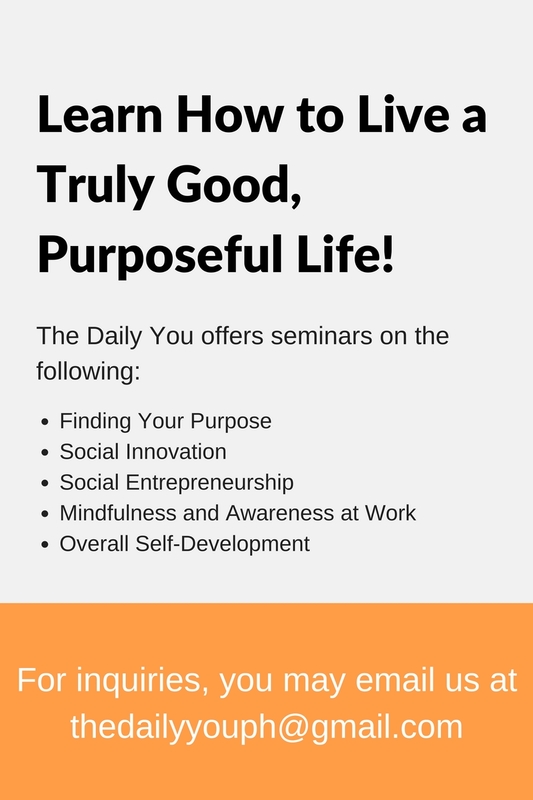 Tags: community, inspiration, inspire, inspireD, passion, Purpose, TDY, The Daily You, Today. Bookmark the permalink.